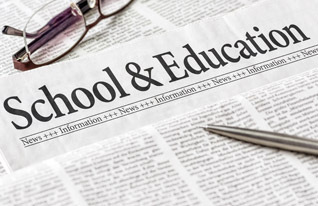 Our Community Education program offers a wide variety of special interest programs. These courses include, but are not limited to, arts and crafts, literacy, hunter safety, driver's education, music, health and wellness. To register for a class, please send an email to our Community Education Coordinator, Lisa Shadrick. You may also fill out our online registration form, call her office at (307) 436.7555, or call or text her mobile phone at (307) 554.0018. Check back often to see our current list of classes. 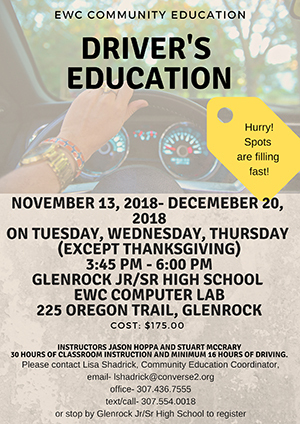 EWC Community Education is presenting driver’s education classes on Tuesdays, Wednesdays, and Thursdays from November 13 through December 20 (except for Thanksgiving.) The classes will be from 3:45 until 6:00 p.m. in the Glenrock Jr/Sr High School EWC computer lab. The cost is $175.00. Instructors Jason Hoppa and Stuart McCrary will provide 30 hours of classroom instructions and a minimum of 16 hours of driving. Spots are filling fast, so hurry up and register! Please contact Lisa Shadrick at (307) 554.0018 with any questions and to register, or stop by Glenrock Jr/Sr High School. Questions about our Community Education program? Please contact Lisa Shadrick. Are you looking to help build our community education class offerings? Are you looking to share your amazing skills and talents with our community? You can make your own schedule and can earn a little extra spending money. You can also contribute/volunteer to make Glenrock great…always! If interested, please contact Lisa Shadrick by calling or texting (307) 554.0018, or complete our information form.